Everything below is from LAST YEAR. But, you get a sense for what it was like, and what it may be like this year. Stay tuned! 12pm – 3pm Grape Stomping “I Love Lucy” style. WANTED: Grape Stompers with big feet and good balance! 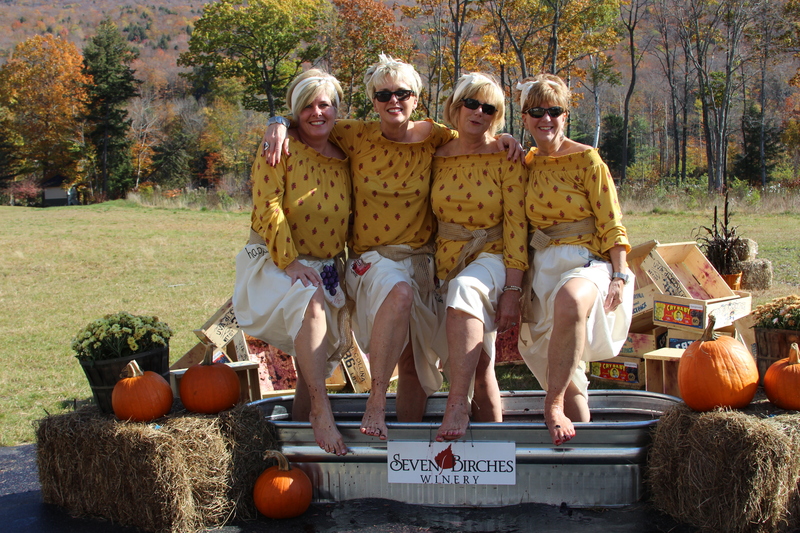 Join us on Saturday, October 20th at our winery, located at the RiverWalk Resort at Loon Mountain for a day of grape stomping, wine tasting, winemaker tours, celebrations and more. Everyone always asks us if we crush our grapes like Lucy did in her famous skit on TV. The short answer is… Yes we do, at our White Mountains Crush Festival aka “CRUSH” event. We need your help (kind of) in stomping these grapes and starting the winemaking season. We are celebrating the end of the harvest season, and the start of the winemaking season on this one special day. Stomp grapes, sample wine, learn from our winemakers, and eat your heart out. Stomp & Picnic Package: This package SOLD OUT. Tour, Stomp, Picnic, Wine Tasting (No Dinner) Package: This package SOLD OUT. Do Everything Package: This package SOLD OUT. *BONUS: All overnight guests will receive a souvenir RiverWalk wine glass to keep! Grab your video cameras and smart phones for this once-in-a-lifetime photo/video op. Kids and adults get the chance to go back in time to the days when wine grapes were stomped by foot. That’s right, you can roll up the pant legs, and jump right in. No shortage of laughs and smiles here. Included with your stomp ticket is a “Crushed-It” Seven Birches T-shirt. T-shirt sizes will be gathered at the point of reservations online. We’ll be stomping the grapes from 12-3pm, during the stompers’ picnic, so your friends and family will be able to cheer you on. We expect that you’ll be good and tired, after 15-20 minutes of non-stop-stomping… so pace yourself! Of course, bystanders and videographers are free to watch and laugh with the crowd. Not everyone NEEDS to stomp. But, those wishing to do the stomp or any of the other activities, will need tickets. What to expect: Expect to get dirty. The tubs of grapes are not very deep, but you will get splashed, so dress appropriately. You will want to wear loose-leg pants (or shorts) so you can roll up the legs. Or, by all means ruin your pants… up to you. We will have each participant sanitize their feet prior to getting into the tub, and we’ll have nice hot water to wash your feet off when you are done. Plan for purple toes for a while. Kids under the age of 10, STOMP FREE (no reservation required). But, that does not include the t-shirt. Lunch – We’ll have a picnic lunch with entertainment and more vendors while you stomp. T-Shirts – We learned that after you wash your t-shirts with your own grape footprints, they faded. So, we’ll decorate your shirts for you! T-Shirts – We will have men’s, women’s and child sizes as options with your reservations this year. Stomping all of those grapes takes a lot of work, so you’ll be thankful that you bought the Stompers’ Picnic ticket. Bring your picnic blankets and camp chairs to enjoy the food, sights, and sounds of the White Mountains. Join your fellow crushers outside (under the tent) for a special “boxed lunch” picnic with music, yard games, and a variety of craft vendors from around the region. Boxed lunch will include a sandwich of your choice, chips, pasta/potato salad, soft beverage or water, and cookie/brownie. Your ticket includes both lunch and the live band entertainment. The 10am, 11am & 12pm tour times are SOLD OUT. But, we have added a 9am tour. Interested in how our wines are hand-crafted, right here in The White Mountains of New Hampshire? Included with this ticket is a “Meet the Winemakers” tour during one of the 2 available tour times. 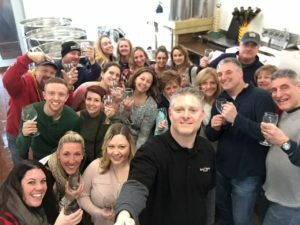 This intimate tour of the winery and chat with our winemakers is a fantastic way to experience Seven Birches Winery. Try a sample of wine aging in one of our oak barrels; chat with one of our winemakers as they demonstrate the equipment and describe the winemaking process. When buying your tickets for the event, you will be asked to select a tour times: 9am, 10am, 11am or 12pm. Times are subject to availability, so if you have a preference, please book early. Space is limited. Take a break from the action to sample a special selection of wines with our winemakers in the winery production room. Much like our spring wine club release party, this is an opportunity for you to sample 6 wines that have not yet been released to the public. In fact, the 6 wines we’ll be tasting are the wines included in the fall release of our wine club. As you taste your flight of wines, our winemaker(s) will tell you a little more about where the fruit is from, how it is transformed into wine, and what to expect in the coming years. This is in addition to our regular tasting room hours of 12pm to 8pm, where you are more than welcome to select from our current wine tasting menu, out on the veranda or in our tasting room. Join us on the outdoor veranda of RiverWalk Resort at Loon Mountain, overlooking South Peak and the Pemi River, for the final celebration of the season. 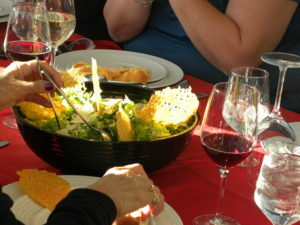 Enjoy this feast, prepared and served outside, in the twilight, family-style by LaVista Italian Cuisine. Included with your dinner ticket is an all-inclusive meal. That’s right… all you can eat Italian food, plenty of Seven Birches wine, music, family and friends, all included. There is a cash-bar, just in case someone is not a wine drinker. Yes, there are some people that don’t drink wine… and they are welcome, of course! You can expect an array of pasta dishes, meats, breads, salads and …. wine, of course. Hummus, calamari, caesar salad, fresh garden salads, grilled vegetables, spaghetti & meatballs, chicken parmesan, fettuccine alfredo, tortellini pesto, cannoli and more. More than you can actually eat….. but, we’ll give it a shot! Chances are good that it will be cool outside. It is October, after all. So, please dress accordingly. The fine print: The “Do Everything” all-inclusive ticket price of $130 per person will get you into everything that we have going on for this event on October 20th. See below for specific activities and a-la-carte ticket options. You MAY purchase tickets for individual activities now but we cannot guarantee that you will be able to add on other activities later. They may get sold out. Ticket sales are limited and are on a first-come, first-served, reservations basis. There is a possibility that this event will sell out, so it is recommended to purchase tickets early. Once purchased, we have no way of returning the electronic ticket, so all sales are final. When buying certain tickets, you will be asked for your T-Shirt Size and your Tour time. Grape stomping does not require a specific reservation. Please bring your printed ticket, or an electronic version with you when you come. That will get you into your paid events. New England weather is finicky, so please plan accordingly; this event will happen rain, wind, snow, or shine (or any mix of the above, which also happens here in the mountains). Check our more in our FAQ’s. There’s no question that parts of the event will sell out… and some already have. Please book right away to secure your spot. You may notice that some individual event tickets sell out, but there are still tickets available for combo packages. Why? When one event within a combo package is sold out, that means that combo package can no longer be sold as is. Generally, after an event is sold out, the only way to get in is to buy the “DO EVERYTHING” ticket. We want everyone to enjoy themselves without fighting a crowd, and for this reason, we limit attendance to some of the events. We hope you understand. What's new this year, compared to 2017? 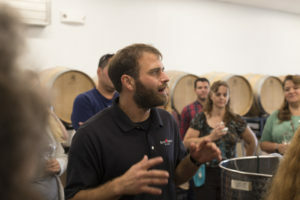 Winery tours are more focused on the education of the winemaking process than they are on the individual wines. The tour will include a barrel tasting rather than a tasting flight, which is a bit more special. We’ve added a winemakers wine tasting and club release event, focusing on the release of 6 new wines. The stomp will be accompanied by an outdoor picnic, with food available in the stomp area. T-shirts will be available in Men’s, Women’s, and Child sizes. We’ve learned that the stomp-feet-stains on the tees do not last, so we will not encourage that. Our shirts will have another graphic on them. Wine is now available by the glass in our tasting room. Bottles may be purchased for external consumption. We sell everything you need to buy a bottle and take outside to enjoy for the picnic. 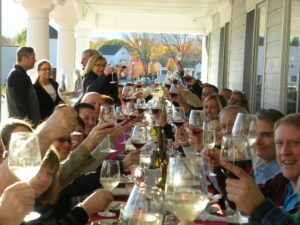 What's the difference between the ``Winemakers Wine Tasting`` and regular wine tasting in your tasting room? The “Winemakers Wine Tasting” will be focused on the release of 6 new wines that are included in the fall release of our wine club. Those wines will not be available on the standard tasting room menu, however will be available for purchase. Plus, you’ll get to check out our equipment and chat with our winemakers. Do existing wine club members get any sort of discount to the events? Wine club members will get a 15% discount on all events of the day. Please check your email or contact us for your promotion code to get the discount. IF you are considering joining the wine club, now would be the perfect time to save! Discounted tickets do not include hotel rooms. And, the discount will expire on August 21st, 2018. Book now! Can we pick up our fall wine club release at the event? Yes. 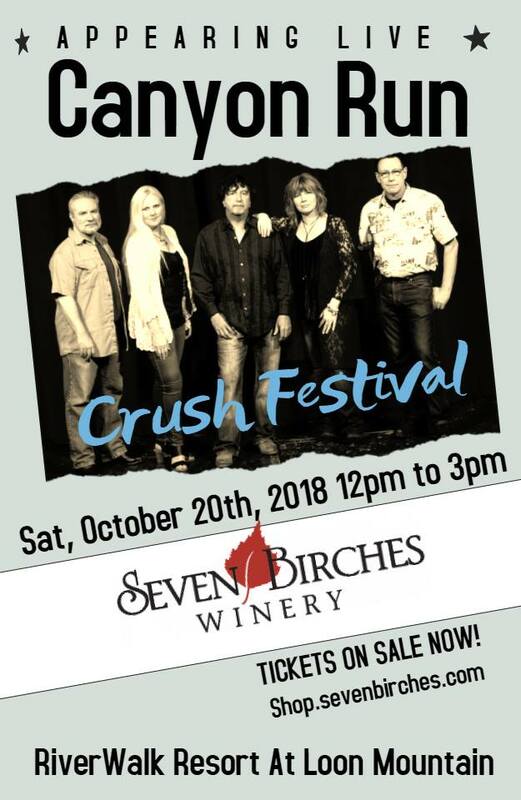 In fact, the “Winemakers Wine Tasting” is a mini party within a party at the CRUSH festival this year. Wines included in the fall release will be sampled during this part of the day. Make sure you come taste what you are taking home. IF you were here at the spring release party, it will be like that. Can we bring pets to the event? No. For the safety, security, and enjoyment of all, we ask you to keep your pets at home this weekend. Boarding is available nearby. Can we bring our own wine to the picnic/stomp? Wine by the bottle is available for purchase in the tasting room. You are able to bring wine out to the picnic, however glass is not allowed. For that reason, we are fully stocked with plastic bottles, plastic glasses, and all the implements you’ll need to enjoy the wine safely. Indeed we are. Click here for more information on becoming a vendor at the festival.